We end up eating a lot of bread in our household. And I make quite a bit of it myself. In fact, one of the easiest ways for me to pleasantly surprise Angela is to start making bread before she gets home. I’ve even developed a “quick” recipe for bread that I make regularly and is the metric for any bread we eat, whether I make it or it’s produced elsewhere. This is not that bread. The bread that I make, while quite good, does not involve any special technique. I decided that I’d like to really take my bread making up a notch and improve both my knowledge of bread making as well as my technique. This is my first attempt at a more advanced bread. Actually, it’s my second attempt at this bread. The first attempt was good but I improperly shaped it so it ended up too short. 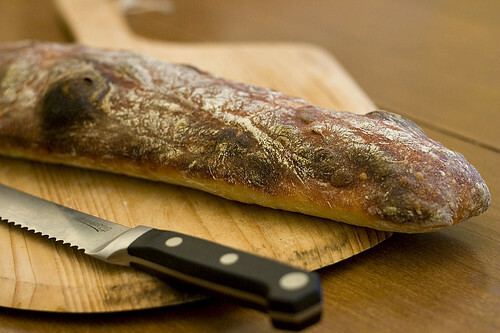 I made this using the baker’s percentages (the recipe as written makes something like 6 baguettes which is 5 more baguettes than I would eat) which made it quite easy for me to use metric measurements. The only hard part was measuring out 2 g of yeast. The bread turned out quite well. Given it’s overnight fermentation, it developed a very nice flavor. 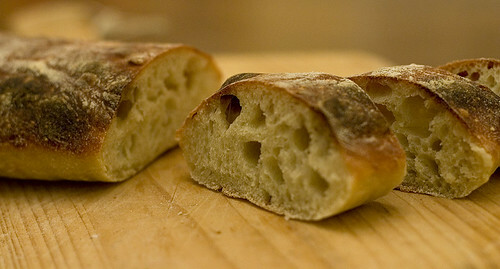 The wetness of the dough led to a very light, airy dough; much more so than the dense bread that I normally make. I will definitely be making this bread again whenever I have the time. It went very well with an herb brined roast chicken and a bottle of 2007 Mandolina Rosato. In the bowl of an electric mixer, combine the flour, salt, yeast, and water. Beat with the paddle attachment for 2 minutes on low. Switch to the dough hook and beat for 5 minutes on medium. Transfer to a lightly oiled bowl. Cover and refrigerate overnight. Remove from the refrigerator and allow to rise at room temperature until it has doubled, 2 to 3 hours. Using a plastic dough scraper, transfer the dough to a well floured counter. Shape into a bâtard. Carefully transfer to a parchment lined baking sheet and cover until ready to bake. In the oven, place a pizza stone on the top rack and a cast iron dutch oven on the bottom rack. Preheat the oven to 500ºF. Bring 2 cups of water to a boil. When the oven is preheated, place the baking sheet on the pizza stone and carefully pour the boiling water into the dutch oven. Immediately reduce the temperature to 475ºF and bake for 8 to 9 minutes. Turn the bread if it is not browning evenly. Bake for another 10 to 15 minutes or until the bread is a rich golden brown. 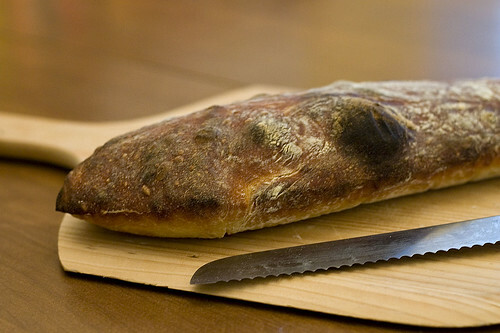 Remove the bread from the oven and allow to cool for at least 20 minutes before serving. I typed up the recipe and posted the pictures to flickr a week and a half ago. Unfortunately, the real world interrupted and I never got around to writing an introduction. It appears that I’ve been a bad blog writer so my apologies. But this recipe should be worth the wait. The best lamb I’ve ever had was Gigot D’agneau at a somewhat random bistro in Paris. The lamb was tender but flavorful. The accompanying gratin dauphinois was amazing (I had to keep close watch over it so Angela didn’t eat all of it). The ambiance was good including the French group at the next table reciting Chuck Norris facts in English (the rest of their conversation was in French). This is almost as good. I noticed this when flipping through Gourmet and was immediately interested. Even the name makes it sound good. The in-magazine pictures didn’t hurt. We don’t usually eat rack of lamb because of the price but decided that it was worth a try. And it ended up being worth every penny. The lamb was tender and tasty. I’d almost recommend this as a dish to serve guests but the lamb is good that we ended up picking up individual lamb chops and biting off the bits of remaining meat. It probably is worth making a fool of one’s self for. When making this, consider making extra potatoes (assuming they’ll fit in the pan). The potatoes are quite good and, in our household at least, extra potatoes are always well received. This would go nicely with a nice Syrah or Shiraz (the 2001 Daniel Gehrs Shiraz we opened had gotten a little too old). 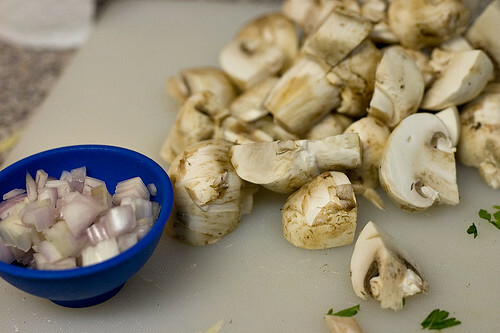 Mash the garlic into a paste and add 1/2 tsp salt and 1/2 tsp pepper. 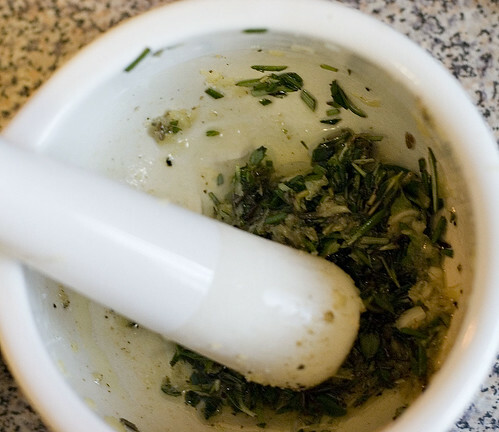 Stir in the thyme and rosemary and 1 tbsp olive oil. Put the tomatoes cut side up in a small baking dish. Sprinkle 1/3 of the garlic mixture over the tomatoes. Bake the tomatoes for 30 to 40 minutes total. Meanwhile, cut the lamb rack in half and dry the lamb with paper towels and season it all over with salt and pepper. Heat 1 tbsp olive oil in an oven proof skillet over medium-high heat. Brown the lamb on all sides, about 6 minutes total. Set the lamb aside. Discard the oil. Add 1 tbsp more olive oil to skillet over medium-high heat. Add the shallots and potatoes and cook into they are just beginning to brown. Add the water and stir in 1/2 of the remaining garlic mixture to the skillet. Season the potatoes with salt and pepper. Remove from the heat. 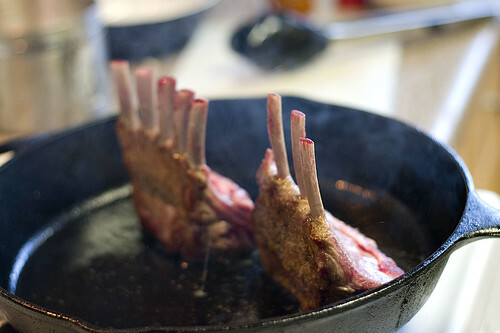 Rub the remaining garlic mixture on the fat side of the lamb racks. 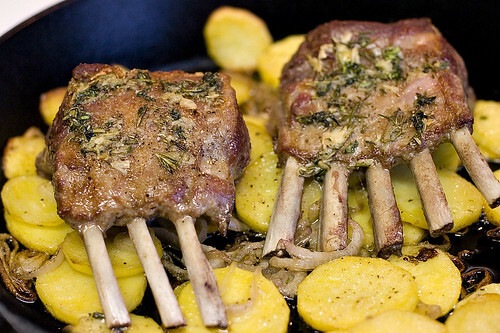 Place the lamb racks on top of the potatoes, fat side up. Roast in the oven until the lamb reaches an internal temperature of 135ºF about 25 minutes. Remove from the oven and allow the lamb to rest for 5 minutes. Serve with the roasted tomatoes. According to Patricia Wells, one can never have too many potato gratin recipes. I agree. It may seem as if I chronicle Angela’s dislike of foods too often on here, but I can always make her smile by welcoming her home from work or school with a potato gratin in the oven. In fact, I don’t believe I’ve made one for someone who hasn’t fallen in love with it. Potato gratins manage to be both decadent and homey at the same time. While you may not have eaten them growing up (I know I certainly did not), they still manage to be comfort food. Somehow they manage to transcend cultural boundaries. If you’ve been paying attention, this recipe may seem similar to Gratin Dauphinois Madame Cartet (Madame Cartet’s Potato Gratin). And that would be due to the fact that they can be found in the same cookbook. In fact, they are on adjoining pages. 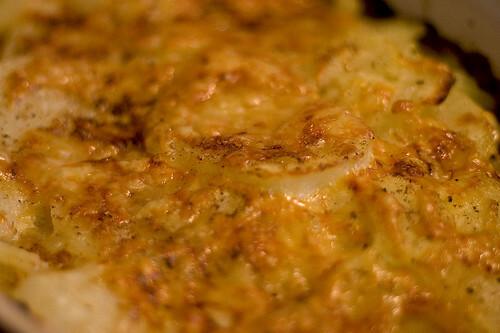 Why bother with different potato gratin recipes? The obvious answer is that they’re all different. But more precisely, they compliment other foods differently. The gratin from Madame Cartet has dominate flavors of cheese and cream. It is undeniably rich. This gratin gains stronger flavors from the bay leaf and the nutmeg. They help to reduce the richness of the gratin. It compliments foods which are less rich. 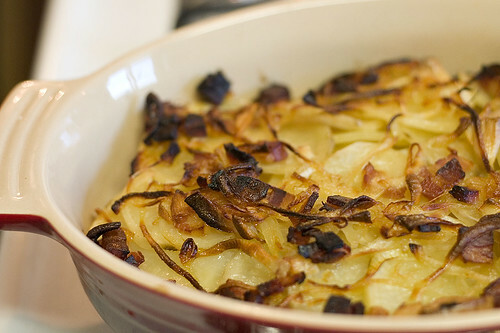 This is a bit more complicated version of a potato gratin. 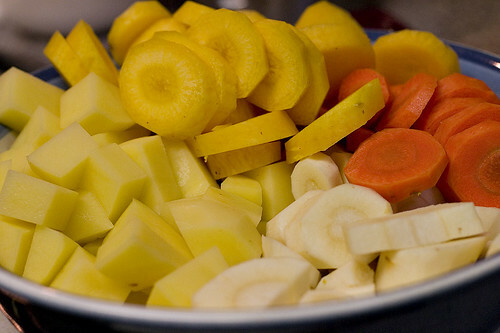 It requires the potatoes first be parboiled in milk which requires a little extra time but not that much extra work. It mainly needs extra planning. Transfer half of the potatoes from the sauce pan to a large gratin dish. Cover the potatoes with half the crème fraîche. Sprinkle with half the cheese, nutmeg, and pepper. Add the remaining potatoes then cover with the remaining crème fraîche. Sprinkle with the remaining cheese, nutmeg, and pepper. Bake the gratin for about 1 hour, or until it is crispy and golden on top. These are the most addictive cookies I’ve ever eaten. Even more so than Thin Mints. It took a significant amount of will-power to not eat just one more. Well, that was until we ate them all. They only lasted two days. There was a slight bit of miscommunication in our household involving the cookies (“Matthew ate them all!”). Angela still isn’t amused by that. 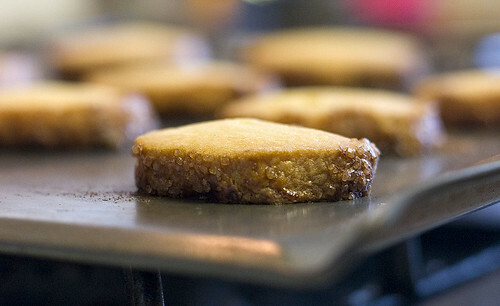 Sablés are lightly sweet with a predominant butter flavor. In many ways, they are very French. They’re basically the cookie form of a sweet tart dough but they also manage to be just a bit better than straight tart dough would be. It may just be the shape (or the added sugar coating). The problem I always have with recipes that need to be refrigerated is that when I want to make cookies, I want to make the cookies right now. I don’t want to have to wait several hours to have the sweet ambrosia; I want it now. It was my good fortune to actually wait and make these cookies. The wait was definitely worth it. We were nearly fighting over the cookies; they were that good. In a stand mixer fitted with the paddle attachment, cream the butter at medium speed. Add the sugars and salt and beat until well blended, about 1 minute. Reduce the speed to low and beat in 2 of the egg yolks. Turn off the mixer and add the flour. Pulse the mixer at low speed 5 times to begin to combine the flour. Mix at low speed for about 30 seconds or until the flour is well incorporated. Remove the dough from the mixer bowl and place on a work surface. Divide the dough in half. Shape each half into an approximately 9-inch long smooth log and wrap it with plastic wrap. Refrigerate for at least 3 hours, preferably overnight. Working with one log at a time, brush it on all sides with beaten egg yolk. Sprinkle all over with the coarse sugar. Slice the log into 1/3 inch thick cookies. 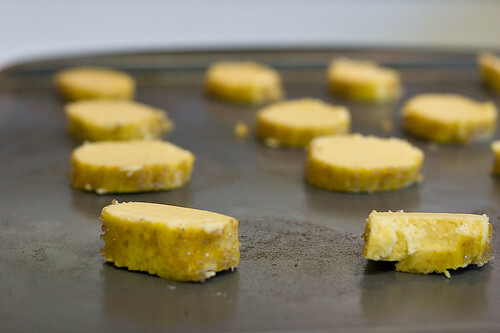 Place the cookies on a baking sheet, separated by 1 inch. Bake for 17 to 20 minutes or until they are lightly browned on top. I’m constantly looking for new ways to cook potatoes. We eat a lot of potatoes (in reality, we just eat a lot of starch; we’re on an inverse Atkins diet). My standbys are mashed potatoes or Gratin Dauphinois but I’m always on the look out for something to complement them. Or, more simply, there are times when I don’t want something as heavy as either of those; where it’s too hot out for something that rich or just too heavy. 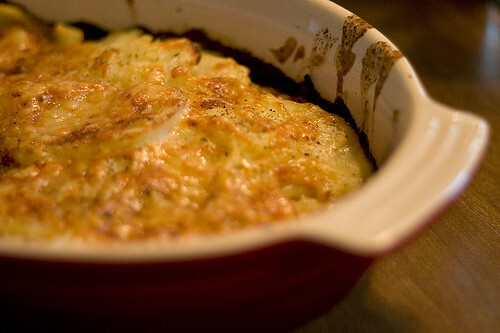 The only similarity this gratin shares with other gratins is that it’s cooked in a gratin dish. It has no milk or cream. It has no cheese. It does have onions, garlic, and bacon which happen to be three of my favorite things (I won’t channel Julie Andrews for everyone’s sake). To an extent, it vaguely reminds me of an Alsatian Tarte Flambée but with garlic and without cream. While it’s not particular hot here in Southern California, my kitchen manages to get that way. As does our whole apartment in the afternoon (I blame our west facing windows). So heavy and creamy are out and light and garlicky are in. We had this with Poulet Mistral Le Preiuré (Mistral’s Chicken with Garlic) which, ignoring the statement on that page, goes perfectly with this gratin. The garlic in both dishes compliments each other quite well. Just make sure your date eats as much of it as you do. 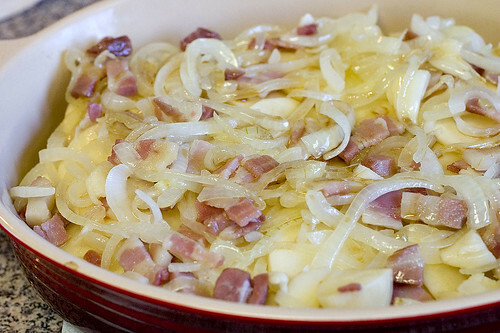 Combine the onions, olive oil, bacon, and garlic in a large skillet over medium heat. Season to taste with salt. 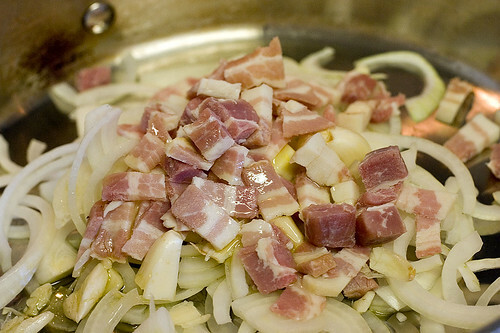 Cook until the bacon and onions are lightly browned, about 5 minutes. Layer the potatoes in a gratin dish, seasoning each layer with salt. Top with the onion and bacon mixture. Drizzle the reduced stock over the gratin. Season with black pepper. Bake in the oven for 1 hour to 11/2 hours, or until the potatoes are cooked through. Regulate the heat so the onions don’t burn. For those of you who were hoping for news of my demise, I hate to disappoint you. Instead, I spent the last 6 weeks or so working with a high school on our robot. We need to ship it last Tuesday (the 19th) and were working on it until 2:30 AM the night before. Given the amount of time and energy Angela and I put into this project (it’s all for the kids, it has nothing to do with the fact that robots are cool, really), we frequently ended up going out to eat instead of cooking. Even on the few nights that weren’t dedicated to robots (and it became fewer and fewer as time went on), we generally went out simply to save our sanity. And, for any who are curious, we compete March 21st and 22nd. And, to make matters worse, I promptly got sick on Wednesday afternoon. Which brings us to today where, hopped up on decongestants, I was inspired to write a post because I watched Gourmet’s Diary of a Foodie about food bloggers. So that’s why you get to read my incoherent, medicated thoughts. If you saw the entries on Cooking Lessons and thought I had been replaced (that could probably have a positive effect on the readership here), those entries are being made by my wonderful wife (I need to win some brownie points). I wish I knew how to get the author to show up by each post but I can’t figure it out without changing the theme. Now, back to the food, I made this lamb stew almost two weeks ago apparently (I had to look at the information on the photos to figure it out). In southern California, we are currently experiencing a semi-spring. It’s still cold enough to be winter (well, as cold as it gets during winter here) but the spring vegetables are showing up at the farmer’s markets. So, of course, I make a stew that claims to be a spring stew but leave out the green beans (they aren’t in season yet) and use frozen peas (fresh aren’t in season). I’m doing a bang up job of eating seasonally. In any case, frozen peas are almost as good as fresh ones and I’m not entirely sure green beans would’ve worked well in the stew as it turned out. Stew also is a bit of a misnomer. When I think of stew, I think of something that is primarily liquid with good-sized chunks of meat and vegetables in it. 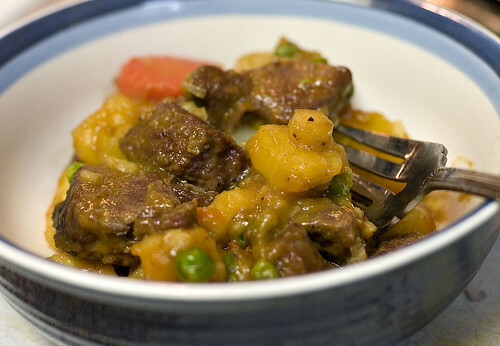 This “stew” consists of good-sized chunks of meat and vegetables with a little bit of liquid covering them. It was good, just not very stewy. Unfortunately, I made the mistake of cutting the lamb into slightly too small pieces. When it cooked, the lamb managed to dry out. So cut your pieces larger than I did. The vegetables were the real stars of this dish. The root vegetables soaked up a lot of the flavors of the lamb (and stock) and were exquisite. I should also note that the recipe for frozen peas is very good on its own. Good enough that Angela specifically asked for me to make it again (and we all know how much she loves vegetables). Season the lamb with salt and pepper and then dry thoroughly on paper towels. Place a skillet over high heat and add the oil. Brown the lamb a few pieces at a time in the hot oil, then transfer to a dutch oven. Sprinkle the lamb with the sugar and then place in the oven for 3 to 4 minutes or until the sugar has begun to caramelize. Pour out the fat from the skillet and add the stock. Bring the stock to a boil and deglaze the pan. Pour the stock into the dutch oven. Bring to a simmer in the dutch oven, then add the tomato paste and boquet garni. Stir to combine, return to a simmer, and then cover the dutch oven. Cook in the oven for 30 minutes to an hour depending on the size of the chunks of lamb. Remove the dutch oven from the oven. Add the potatoes, carrot, parsnips, and onions to the dutch oven and mix well. Bring to a simmer on the stove top, cover, and return to the oven for one hour more. Remove the dutch oven from the oven. Add the peas. Check the sauce for seasoning. Bring the stew to a simmer for 1 minute. Bring the butter, shallots, salt, pepper, and beef stock to a boil in a small saucepan. Add the peas, cover, and simmer for 5 to 6 minutes, or until the peas are tender. Remove the lid and boil off any remaining liquid. Makes 1 cup of peas. Ever have a dinner that is surprisingly good? This was one of them. I never have high hopes for anything based around a chicken breast. They’re frequently dry and tasteless. 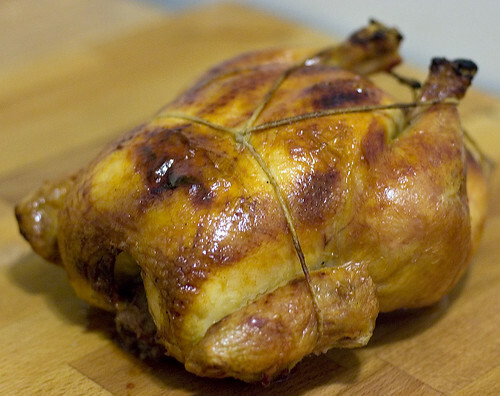 And, while I haven’t tried it, I’m sure that brining helps (yet another thing on my cooking to do list). But, when you get down to it, chicken breasts aren’t particularly exciting. In many ways, they’re the tofu of the meat eating world except they don’t readily take on other flavors as well. Except, when I made Suprêmes de Volaille aux Champignons (I’ve been avoiding using the proper name as it’s a bit incongruous in a sentence), it was surprisingly good. It wasn’t a burst of flavor in your mouth but it was simple and it was good. The chicken wasn’t dry and had some good flavor but the sauce was very creamy and chickeny. It may not be something to serve to guests but it’s good for a weeknight meal. I was particularly fond of the mushrooms (Angela doesn’t like them; and she also complains that I only say she doesn’t like things; she did like the chicken, so there). If you look at the pictures, you’ll think I had only a few but I didn’t ladle the rest of them out of the skillet until after taking the pictures. By the time I was finished, there were more mushrooms than chicken. I should say, however, if you prepare this recipe realize that I did use a smaller chicken that I got from the farmer’s market. The breasts themselves were pretty small, probably only several ounces each; so the times may be different if you use a larger chicken breast. I’d suggest cooking to temperature instead of time. I’m a bit surprised by this recipe as it doesn’t involving browning the chicken. Normally, browning meat is important for the development of flavor but not in this recipe. And I can’t say I missed it. Given that the chicken breast is small, a greater proportion of the flavor comes from the sauce and from the chicken stock in the sauce. 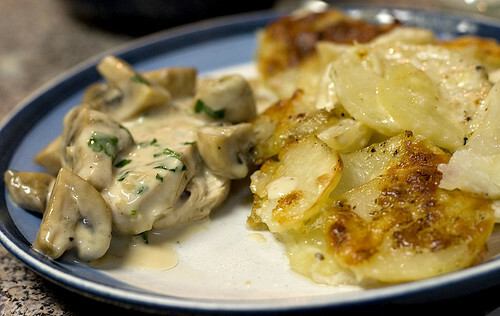 Serve with Gratin Dauphinois Madame Cartet (Madame Cartet’s Potato Gratin). Rub the chicken breasts with a small amount of the lemon juice and season with salt. Set aside. In a large skillet, heat the butter over medium heat until it is foaming. Add the shallots and sauté for 1 minute. 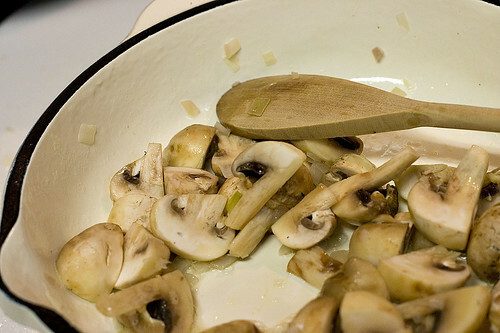 Add the mushrooms and sauté for 2 minutes more. Season with salt. Add the chicken breasts to the skillet and roll them in the butter. Cover the skillet and place it in the oven. Cook for about 7 minutes or until the chicken breasts reach an internal temperature of 165ºF. Remove the skillet from the oven and remove the chicken breasts from the skillet. Add the stock and vermouth to the skillet and bring to a boil over high heat. Boil until the liquid is syrupy. Add the cream and reduce heat to a simmer. Simmer until the cream is thickened. Remove from the heat. Season with salt and lemon juice as needed. Stir in the parsley. Serve the chicken covered with the sauce and mushrooms.